Pittsburgh, PA–A federal grand jury sitting in the U.S. District Court for the Western District of Pennsylvania charged a Pennsylvania man with federal hate crimes, including the murder of 11 people, for his actions during the Oct. 27, 2018 shootings at the Tree of Life Synagogue in Pittsburgh’s Squirrel Hill neighborhood. Robert Bowers, 46, of Baldwin, Pa., was charged in a 44-count indictment returned on Wednesday. 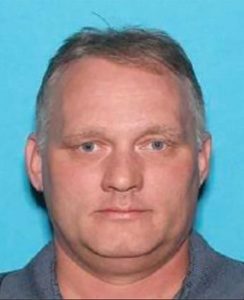 According to the indictment, on Oct. 27, Bowers drove to the Tree of Life Synagogue in Pittsburgh, Pennsylvania, where members of the Tree of Life, Dor Hadash, and New Light Jewish congregations gathered to engage in religious worship. Bowers entered the building armed with multiple firearms, including Glock .357 handguns a Colt AR-15 rifle. The indictment alleges that while inside the Tree of Life Synagogue, Bowers opened fire, killing and injuring members of the three congregations, as well as injuring multiple responding public safety officers. While inside the Tree of Life Synagogue, Bowers made statements indicating his desire to “kill Jews.” “Hatred and violence on the basis of religion can have no place in our society,” Attorney General Jeff Sessions said. “Every American has the right to attend their house of worship in safety. The defendant in this case allegedly murdered 11 innocent people during religious services and injured four law enforcement officers. These alleged crimes are incomprehensibly evil and utterly repugnant to the values of this nation. Therefore this case is not only important to the victims and their loved ones, but to the city of Pittsburgh and the entire nation.” “Today begins the process of seeking justice for the victims of these hateful acts, and healing for the victims’ families, the Jewish community, and our city,” U.S. Attorney Scott Brady said. “Our office will spare no resource, and will work with professionalism, integrity and diligence, in a way that honors the memories of the victims. This is what the public expects from the US Department of Justice. And truly we, as Pittsburghers, can do no other. It is time to go to work.” The victims include 11 worshipers at the Tree of Life Synagogue who were killed, 2 members of the congregation who were critically injured by Bowers and 9 other members of the congregation who escaped unharmed. Additionally, four law enforcement officers were injured trying to stop Bowers’ rampage. The Bowers faces a maximum possible penalty of death, or life without parole, followed by a consecutive sentence of 535 years’ imprisonment.